Mooshoopork » Wooowooo I’m back! I’ve really missed being here…missed the writing outlet, even if it was only the mundane happenings of my day. It still allowed me interaction with the world-feedback, support. I think the redesign is amazing! I’m very proud to call mooshoo mine (thanks to Ev). Life has been crazy and moving really fast these days. Bub is sleeping in a big boy bed…we really didn’t have any problems making the transition. One rough night and then everything fell into place. He is talking so much now. We are so close to sentences and oh yeah he’s discovered no and says it all the time. Ev and I’s new fun game is “ask Bub questions” to which we know he will answer no. He’s so into helping now and feels very proud when he gets to. Aid is also making a bed transition tonight. We are moving him from our bed into the crib. He and Bub will be sharing a room. I have no idea how it will go and don’t really have any expectations. I just hope we all don’t end up in one bed and when I say we all…I mean everyone. Bub is no fun to sleep with-he’s a head banging kicker. 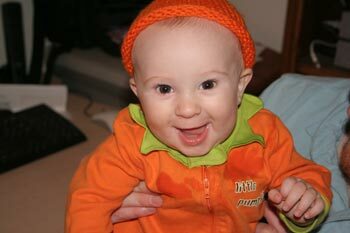 Halloween went really great and was pretty funny…trick or treating for the first time. 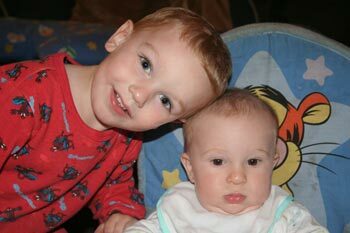 Bub took Ev and Aid with him. He decided to be a cow after trying on every costume in target. I feel like a slacker this year for not planning something cute for them to be, but there’s always next year. 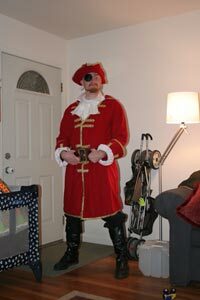 Aid was a pumpkin and Ev was supposed to be a pirate but decided to go as himself at the last minute. We had a few trick or treaters before the boys headed out and Bub seemed to get the jest of things pretty quick. I stayed behind to hand out candy-thinking I’d get some cleaning done. Ha-ha, the doorbell rang every 3 secs. Ev said Bub wouldn’t knock on the doors but definitely went up to get the candy. 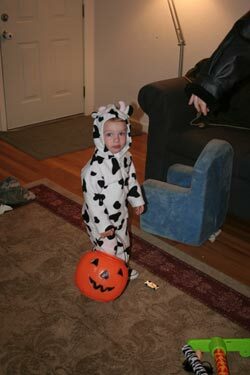 Ev also said he knew it was time to come home when he turned around to see Bub dragging his pumpkin which had his cow top shoved in it, with his cow pants around his ankles. When he’s done-he’s done. Boy and no one reminds you that as you take your 2 year old trick or treating you must also take all the treats away(and hide them) Yeah that was fun as he screamed a dum dum in each hand. How much candy is too much at that age? Heh. As everyone knows I have an amazing husband. Out of no where Ev calls me yesterday and asks if I have any big plans today at 1pm…oh yeah big plans…hot date with laundry and washing the floor. Turns out he made me some big plans-A 60 MINUTE massage!!! Yes one hour –not only kid less-but with someone rubbing my entire body. My back-my feet!!! And let me tell you-IT WAS AMAZING. The actually experience of it was wonderful, but even better then that was the fact that Ev just out of no where did it. I didn’t ask or hint around he just wanted to do something nice. How lucky am I – VERY LUCKY. He also spent a lot of time on this excellent redesign/rebuild. He’s finishing it as I write this now. It’s just another of the thoughtful things he does for me. I mean he’s a busy guy and spends enough time on the computer as is just making money to pay for 60 minute massages. I swear I must have done something really good some where a long the line for God to have given him to me. Anger management has been going well. I’ve had a couple of bad days but over all feel like I’m really getting control. Oddly enough I’ve been practicing time-outs with Bub. I even cut my old yoga mat to make a “time-out mat” It’s small enough to fit in the diaper bad so I can take it with me and do time-out any where we go. We’ve only had two so far-but they worked. He was not a fan of sitting on the square for 2 minutes. I was sure the first time we did it he would get up right away, but he didn’t. He just sat there sad and whimpering until his time was up and I gave him a hug. (OH and it’s been 15 minutes of Aid in the crib in Bub’s room…so far so good. ) I wonder if it will work in public.